Andy Murray safely made it through to the second week of Wimbledon and now faces a tough fourth-round clash with Richard Gasquet. The Frenchman is a highly dangerous opponent and possesses a huge array of shots in his armoury. Murray will draw on memories of a famous five-set win over him at Wimbledon three years ago in which he came from two sets down to win a dramatic encounter in near darkness on Centre Court. Tim Henman, who faced Gasquet twice during his career, analyses where the match could be won or lost and the respective strengths and weaknesses of both players. 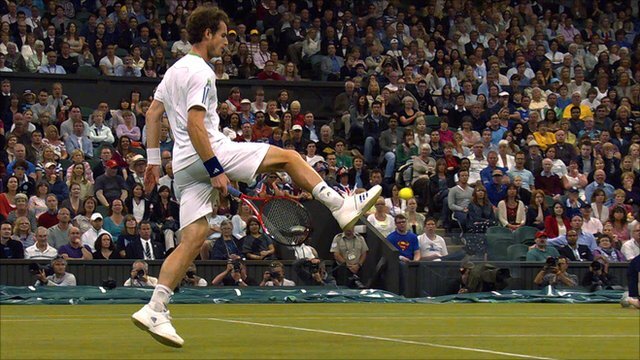 Although Andy Murray has fond memories of beating Richard Gasquet at a five-set classic at Wimbledon in 2008, the world number 13 is a very good player and this is a match that represents another step up in class for Andy. He is another of the flamboyant French contingent currently on the tour and he has pedigree on grass having won twice at Nottingham in 2005 and 2006. I remember him breaking through as a teenager and remarkably he will celebrate his 10th year as a pro next year despite only being 25. It is fair to say that maybe he hasn't pushed on as much as people expected, but he had an unfortunate interruption with a drugs issue in 2009. He was obviously very pleased to put that behind him and has since firmly re-established himself at the top of the game. Having done it before, I don't think he will be fazed by taking on the home favourite on Centre Court. 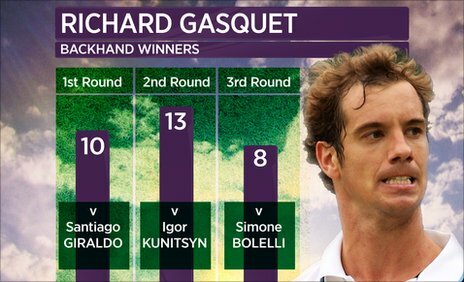 WHAT IS GASQUET'S CURRENT FORM AND WIMBLEDON PEDIGREE? He has been in impressive form at Wimbledon so far and has yet to drop a set, although he has only faced players ranked 63rd, 71st and 117th in the world up to now. His last match at Wimbledon was that five-set epic against Murray back in 2008 as he missed the last two tournaments due that drugs problem in 2009 and a back injury last year. He enjoyed a superb run to the semis in 2007 before losing to Roger Federer. WHAT IS THE KEY SHOT FOR BOTH PLAYERS? He has one of the best single-handed backhands on tour along with Murray's opponent in round three, Ivan Ljubicic. It's really something to look out for. He has an incredibly strong wrist which helps him really accelerate through the ball and he can hit it everywhere. He can change direction to hit it down the line, cross court - it's a huge shot. To put it into context - he hit 13 backhand winners in his second-round match with Igoir Kunitysn, compared with the two Andy Murray hit at the same stage against Tobias Kamke. If he can keep his first serve percentage high, but still be aggressive, it is going to give him the foundation to hold his serve comfortably. If you are holding serve comfortably it often transfers to your return game and can help make you be more aggressive and dangerous on your returns. WHAT WEAKNESSES DO THEY HAVE IN THEIR GAMES? Not many. But if his first serve percentage drops like it did against Tobias Kamke, Gasquet will seize on that. His percentage of 54% in that game won't be good enough against the best players. We are now in the second week and he knows the challenges are going to get harder and harder and I think his intensity level will be right up there. He must also be careful not to be too passive from the baseline. Something I remember when I played Gasquet is that he is not that great a returner of serve. Because he has got very extreme grips I think he finds it difficult to make the adjustment between his forehand and backhand. I used to serve and volley a lot against him as I felt like he was blocking a lot of returns. I wanted to take his time away as he is so powerful and can be so deadly from the baseline that I wanted to give him as little opportunity to dictate as possible. I don't think Murray will serve and volley much but he should be looking to dominate with his second shot. HOW MENTALLY STRONG ARE THEY? Murray really thrives in these conditions and atmosphere these days. He feeds off it. The couple of matches under the roof have been incredible and you can tell he feels totally at home. He has learnt to become a better competitor. Sometimes early in his career he could go away a little bit during games. But I think he is more mature and is a good competitor now. He has played Murray on Centre Court before which makes a big difference. HOW COULD THE CONDITIONS AFFECT THE MATCH? The weather forecast is looking very good so the courts will speed up a bit from the conditions Murray faced under the roof on Friday. This will require a slight readjustment to his game, but he will like it as the ball going through the air a bit quicker will benefit his serve and he can be more aggressive from the back of the court, which is key. TO HOT-DOG OR NOT ? Roger Federer did it to me at the US Open. It was a slightly different shot as it came straight towards me. Good luck to you if you can pull it off. I tried it a few times in my career - it is such a double edged sword - if you pull it off like Andy did you look like a hero, if you get it wrong you look like a plonker. This match will see most of the points played from the baseline so it will come down to who can get the strike in first and keep the unforced errors down. I think it should be a relatively comfortable win for Andy and another step towards the business end of the tournament. Murray to win in four. Tim Henman was talking to BBC Sport's Paul Birch.